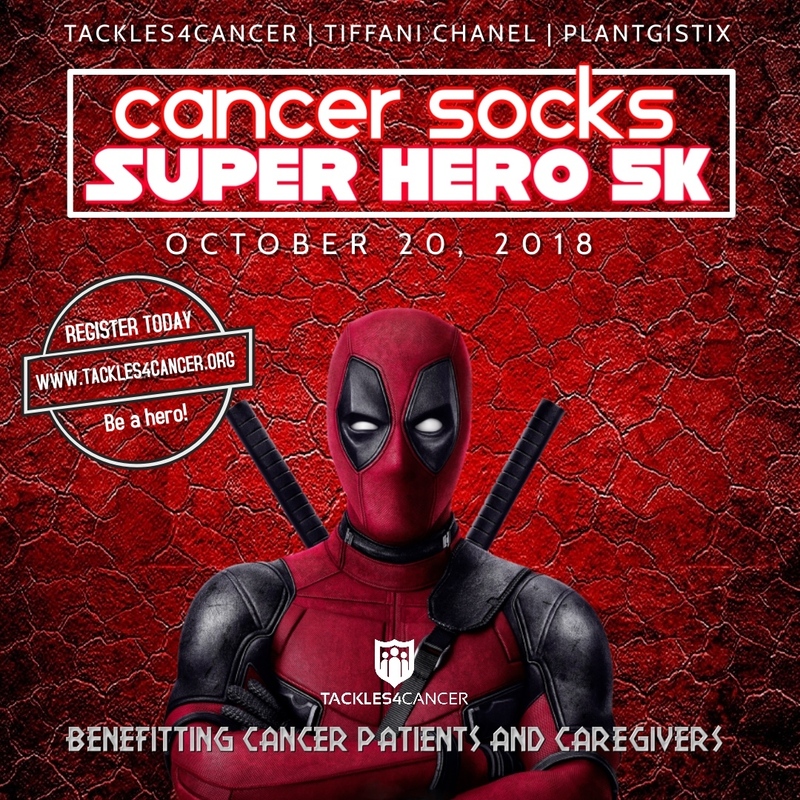 On behalf of Tackles4Cancer you are personally invited to support the 2nd annual Cancer Socks Super Hero 5K/1K Walk-Run on October 20, 2018 in recognition of Breast Cancer Awareness Month. The event will take place at the beautiful Stude Park located at 1031 Stude St from 7:30AM-10AM. The National Cancer Institute reported that 20% of cancer patients will cancel or delay treatment due to lack of transportation resources. Our mission is to improve the quality of life for cancer patients through transportation. Run, walk, volunteer, or invite your friends to be a super hero! 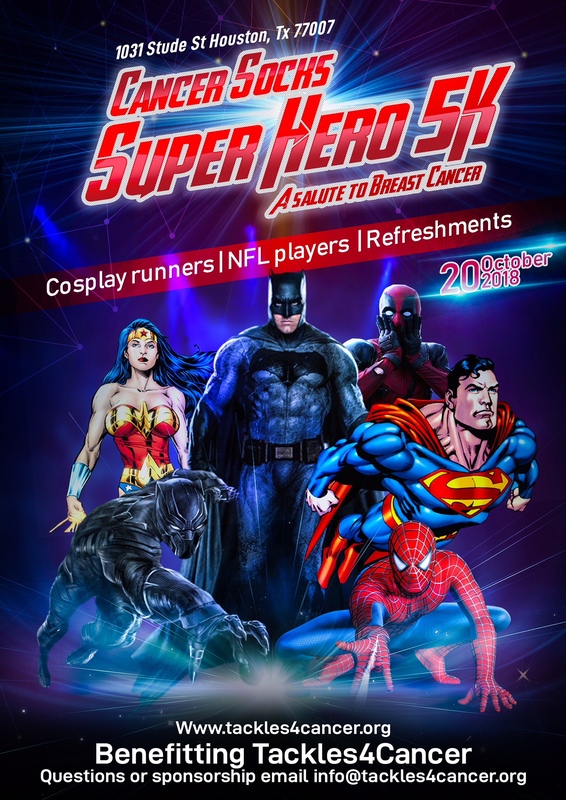 The event is designed to be a family fun event and we encourage everyone to become a super hero for the day by wearing their favorite super hero costume as we recognize our beloved Breast Cancer Heroes. A post race party will follow the 1K event, with food and plenty of fun for big and little super heroes. The race will also feature a costume contest along with an awards ceremony and NFL guests. The proceeds will benefit cancer patients that need transportation assistance. Since 2014 Tackles4Cancer has helped raise over $250, 000 while partnering with the American Cancer Society and other charitable organizations. 90% of the proceeds were donated to make an impact in the lives of cancer patients. We provided over 150 rides in 2017 and we are on track to creating a new milestone in 2018 in order to fulfill our mission to improve the quality of life for cancer patients through transportation. Be a super hero and register today www.tackles4cancer.org ! The proceeds from this event will benefit cancer patients in underserved communities that need transportation assistance. This is a United States Of America Track & Field course and timing at the event will be by Fast Lane Services. PACKET PICK UP will take place on Thursday October 18th and Friday October 19th from 12PM-6PM at Finish Strong Sports located at 6426 Washington Ave, Houston, Tx 77007. Packer pick up will also be available from 6:30AM-8AM on October 20th. 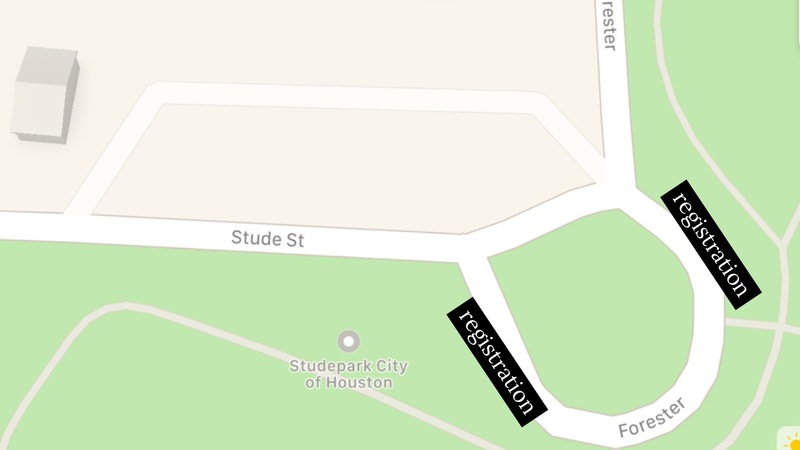 Registration will take place at the circular driveway located at 1031 Stude St, Houston, Tx 77007. Parking is available on a first come first served basis along the street at the intersection of Stude St and Forrester heading north to Usener St (20 parking spaces); Stude St heading east to Studewood St. parking is available on the street and in the small parking lot with (20 parking spaces). We also have access to parking at BB’s Cafe located 3.5 blocks north of Stude Park located on the west corner of Studewood St & White Oak (120 parking spaces) and Lil Woodrow’s is located on the west corner (20 parking spaces) . 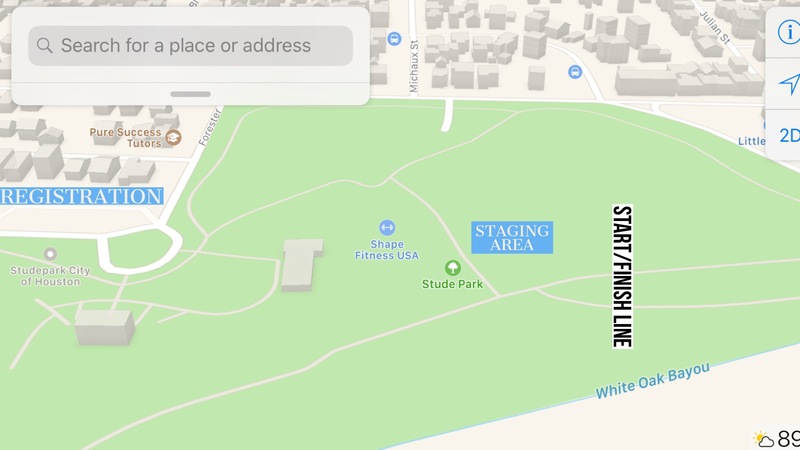 The staging area will be located 200 feet away from the south east corner of Stude Community Center and we will also start the race here. Please let me know if this works for you and have a great day !